Comment: The Productivity Commission put a political landmine in the path of the Government this week by proposing a 'feebate' scheme to force poorer drivers of big old cars and utes to subsidise electric car drivers in the leafy suburbs. It would make the last Labour government's 'nanny state' issues of lightbulbs and showerheads look like walks in the park for this Government. It is also symptomatic of one of its biggest strategic challenges: how to manage a just transformation to a carbon neutral economy that doesn't repeat the mistakes of the deregulation of the late 1980s by leaving the poor behind. On the face of it, without any tweaks or compensation, the fiscally neutral 'feebate' scheme suggested by the Commission on page 351 of its final report on the Low Emissions Economy would mean buyers of big carbon-dioxide-emitting cars (both new and used) would pay thousands extra so the high up-front costs of electric vehicles could be reduced. It would mean 'Te Atatu man' would have to pay tens of thousands more for his double cab ute so that Jacinda Ardern and her neighbours in Mt Eden and Remuera could buy cheaper electric vehicles. This is a big political problem for New Zealand, which has become 'Double Cab Ute Nation' over the last decade. It's worth remembering that the top four new vehicles being sold in New Zealand at the moment are diesel-powered double cab utes (Ford Ranger, Toyota Hilux, Holden Colorado and Mitsubishi Triton). Eight of the top 10 new cars being sold are double cab utes or SUVs. They are heavy vehicles with relatively larger engines. The only two 'normal' cars with smaller engines are the Toyota Corolla at number five, which is mostly bought by rental car fleet buyers, and the Suzuki Swift at number 10. There are currently new 65 double cab utes being bought for every one new or used electric vehicle. 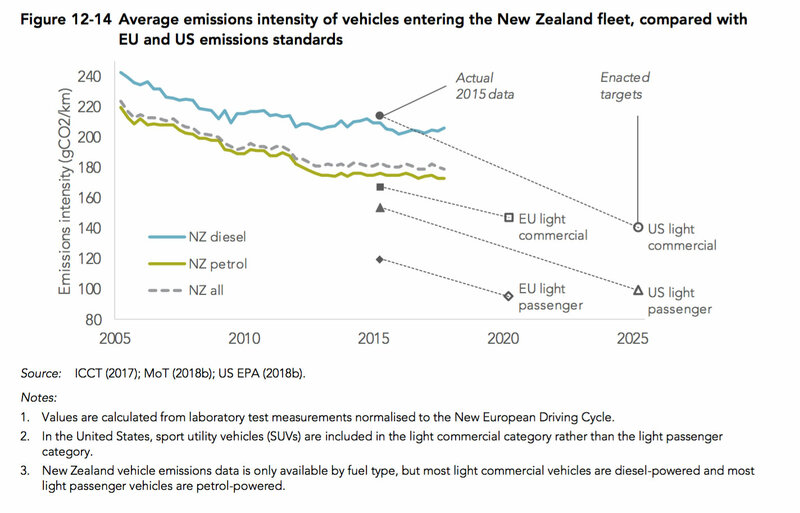 The Productivity Commission made the point that New Zealanders are increasingly buying larger and heavier vehicles, which has made our aged fleet relatively more emissions intensive than others, and has stopped the natural improvement of the fleet as engines becoming more efficient. The big switch from 'normal' passenger cars like the Toyota Corolla and Holden Commodore to double cab utes and SUVs after 2008 has negated the ongoing impact of improvements in engine efficiency. The Productivity Commission's revenue-neutral scheme would see the price of the vehicles currently beloved of the outer suburbs and provinces dramatically increase in price so Green and Labour-voting central city types could buy cheaper Nissan Leafs and Hyundai Ioniqs. Prime Minister Jacinda Ardern already has an Ioniq. The Productivity Commission did acknowledge the political and fairness risks in its report, suggesting the scheme may have to be subsidised by taxpayers more generally by not being revenue neutral. "A revenue neutral scheme may be more politically acceptable than the alternative. But, the Government may prefer for a feebate to come at a fiscal cost (ie, adopt larger rebates and/or smaller fees), for instance to limit impacts on low-income households or to further incentivise EV uptake," it wrote in the report. "The introduction of a feebate scheme would effectively raise prices for high-emitting vehicles newly imported into New Zealand. Given current prices for EVs and the limited range of models available, feebates would very likely be regressive," it wrote. "In other words, lower-income households would likely disproportionately bear the costs of a feebate scheme. "To make low-emissions vehicles a more viable option for lower-income households, a feebate system could provide these households with a greater rebate when purchasing EVs." It said California's EV rebate system used this approach, whereby a household with income below a set threshold received a rebate of US$4500 when purchasing a battery EV, compared to US$2500 for a standard household. Another way to soften the blow would be to have a scrappage scheme with a high rebate for old cars. New Zealand has an increasingly aged fleet filled with long-running used imports. The average fleet age has risen to 14.2 years this year from 11.8 years in 2000. One way to reduce its emissions intensity would be to reduce the age of the fleet by offering a rebate to scrap older cars. The Productivity Commission referred to a successful UK scheme from 2009 where vouchers worth $3500 to $4000 were given to owners of old cars to buy more efficient vehicles. More than 700,000 cars were scrapped, but it cost $2.8 billion. "Even if a scrappage scheme may not be efficient in terms of emission reduction benefits relative to fiscal costs, the potential social benefits of the scheme may justify further consideration of such a scheme," the Commission wrote. "Offering incentives to scrap older vehicles can provide a way of making lower-emitting vehicles more accessible to lower-income households. The incentives could limit any negative impacts from other transport mitigation policies, such as feebates or emissions standards, on these households." It also suggested means testing for such rebates. The other options included setting standards for emissions levels, which would simply ban the importation of emissions heavy vehicles, which would currently include many older and larger used imports such as the Isuzu Bighorn or Toyota Prado. That would increase prices of the vehicles many poorer families in the outer suburbs and provinces prefer to buy. The Ministry of Transport is understood to be working on a discussion paper on the options for feebate scheme or new standards, which was delayed until after the issue of this paper. The Government will have to be very careful not to create a backlash from poorer voters if it proposes a policy that dramatically increases their costs of motoring without compensation, on top of the fuel excise levy increases already baked in.